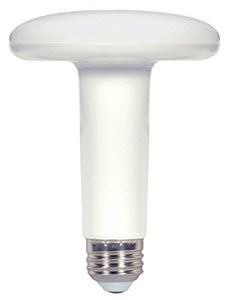 LED BR30 9 watt flood light bulbs are a replacement for other types of 65 watt BR30 or R30 lamps using far fewer watts. These have an unusual shape but once installed inside the recessed light fixture or track light fixture; they look the same as regular BR30 incandescent flood lights. This will save you a lot of energy, and you won't have to change light bulbs like you used to. It has a warm white 2700K color which is the most popular use for a home lighting situation to bring out the warmer colors and earth tones that many people have in their homes. The long neck makes it possible to screw these into recessed lighting, and these are the same length as the old-style BR30 incandescent floods. You'll enjoy the excellent color rendering and energy savings along with knowing that you're helping the environment by using fewer. But even though you're using fewer energy, you're not compromising with the light levels that you have for your home or office. It's a great product at a special price, and we like the fact that we can pass the savings along to you on this item. - 25,000 average rated life. - Replaces 65 watts BR30 incandescent. - The same look of the traditional reflector when installed. At BuyLightFixtures.com, we provide some of the highest quality LED lights in America, products that are going to last you a long time in the future. We want to make sure the quality that we deliver not only gives you excellent energy savings that give you the kind of performance that you’re expecting from something that usually costs more. These BR30 lights are just one of the products that we carry that can produce light that’s going to replace the old incandescent bulbs or halogen lights. So the energy savings is going to be very substantial while giving you what we believe is a better lighting job at the same time. These typically screw-in existing E26 medium base sockets or track lighting and will provide you with the same effect as what you’re used to having now. Most of the time these BR30 LED lights are a 65w equivalent used in many types of downlighting or track lights.